So far Tesla Motors has defied the odds, which are stacked against any new entries in the automotive space. Last month, the company’s Model S sedan was delivered ahead of schedule. The Model S was independently developed by Tesla from scratch over a space of three years. This was the culmination of a design, development and marketing plan executed nearly flawlessly over the past few years. Volkswagen’s E-Bugster: Will The Green Car Boost The Automobile Giant’s Eco-Reputation? To say that Volkswagen hasn’t been a leader in green cars is putting it mildly. DUBLIN–(BUSINESS WIRE)–Research and Markets (http://www.researchandmarkets.com/research/m7cp2l/electric_vehicle_t) has announced the addition of John Wiley and Sons Ltd’s new book “Electric Vehicle Technology Explained” to their offering. Energy producer Hydro-Quebec has announced it will partner with GRIDbot Canada to develop a new bi-directional charging station for an experimental electric vehicle program, HydroWorld.com has learned. I just returned from a week-long reporting trip during which I drove a 2012 Nissan LEAF from Seattle to Wenatchee, Washington, and back again. I put 487 miles on the car, crossed a 4,000-foot mountain pass, twice, and plugged in everywhere from a friend’s house to a swanky downtown parking garage to a mountain town with a population of 202. I realize that everyone is busy—in the past week, we’ve been approached by two independent sources asking whether we could help generate some responses to surveys that have been posted on line. If you have 15 minutes to spare, you should be able to complete both. A national strategy for the introduction of electric cars in Malta was launched this morning. The strategy was spearheaded by a committee set up in June last year which consulted with stakeholders. It also carried out a survey on the public’s perception of conventional cars and attitude to alternative means of transport. Teachers across the state have spent their summer learning through the Department of Education Leadership Institute. This week, automotive teachers from high schools and technical programs are in Morgantown for a pilot program with West Virginia University’s National Alternative Fuels Training Consortium. Remember back in 2008 when Tesla decided to move the production of its Model S electric car from New Mexico to California? Well, so does the developer that was going to build the facility — they’re suing Tesla for breach of contract and fraud. 1-Hour Interview With Elon Musk: Tesla, SolarCity, Electric Planes, ‘Fool Cells”, and Lots More..
Chargepoint, the largest online global charging network, which connects drivers of electric vehicles to charging stations throughout 14 countries, has announced its latest mobile application for all iOS and Android smart phones. The app will include a variety of social network options. Electric Vehicles Get Big Boost! BMW i Ventures, the investment arm of BMW, just made an investment in EV Charging Stations maker Coulomb Technologies. BMW has released a report on its yearlong electric vehicle road test in Beijing, just days after the Chinese government rolled out a plan to boost the country’s electric vehicle industry. BMW hopes the test will facilitate the development of both its future EV models and China’s EV industry. How is China’s EV industry developing? And what are the barriers it must overcome? Just when we thought BMW was content to have made a spectacular splash with its all electric i3 and its gorgeous plug-in hybrid i8, here comes the C Evolution electric scooter. Want to buy an electric car but can’t get over your range anxiety? 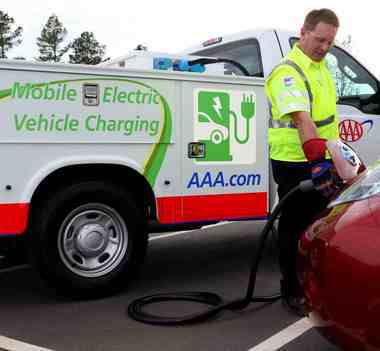 A new member benefit being offered by AAA of Oregon and Idaho in the Portland area might help you make a baby step into the EV commuting world. BMW has big plans for its i brand of plug-in electric cars, giving the lineup its own visual design language and its first foray into online sales. It may not save the planet, but buying this electric car could do some good on the other side of it. It seems that extra weight really affects a car’s crash safety considerably. Apparently, the 54.5 extra kilos (120 lbs) the plug-in Toyota Prius has over the non-plug-in model have made a big difference in its safety rating. Highway operators will install quick-charging facilities for electric vehicles at 100 spots throughout Japan by 2020, the Nikkei said. EVs already sold in Japan include the Mitsubishi i-MiEV and Nissan Leaf while Honda launches the Fit [Jazz] EV at the end of August. Electric vehicles of any type are still rare enough to earn second looks. So when a high-end Fisker EVer Karma appeared plugged into a charge station along downtown Holland’s Eighth Street, it caused a sensation, with motorists and pedestrians alike rubbernecking as they passed. The car’s cooling fan could be heard humming as it charged. GPS can be a very useful, if sometimes distracting, navigation aid while driving to your destination. I sometimes use the GPS system in my Prius to help me explore non-highway routes for a sort of backroads-type experience. What if GPS technology could also be an aid to help electric vehicle drivers eke out more driving range? That’s the focus of a recent study in California. The Electric Drive Transportation Association (EDTA) strongly believes electricity can be a key solution to reducing American dependence on foreign oil and improving the U.S. economy. This it made clear Thursday, July 26 when EDTA President Brian Wynne testified during a Subcommittee hearing on Energy and Environment before the U.S. House of Representatives Science Committee. The System is the first of its kind to use Princeton Power’s Demand Response Inverter. PRINCETON, N.J., Jul 30, 2012 (BUSINESS WIRE) — Princeton Power Systems (PPS) turns on its Energy Storage System (ESS) at BMW Group’s Technology Office in Mountain View, CA. The ESS is the first of its kind to use PPS’ new Demand Response Inverter in an integrated system.